I was back at Dillington for this weekends match and I have to admit that after getting it wrong in the two matches I’ve fished so far, I didn’t know what I was going to do today. Another cracking Ilminster Bowling Club breakfast set me up for the day and great value at a fiver. Rob announced the draw and after delving into the bucket of dreams I was quite pleased to see I was on number 7 on the far side, a decent area. The forecast for the day wasn’t great with storms predicted in the afternoon although as we took our kit to the pegs it was nice and sunny and hopefully they’d got it wrong again. I’d popped to Tackleuk yesterday to pick up bait and also bought some bits and bobs and made up several new rigs up and tied a load of hooks. 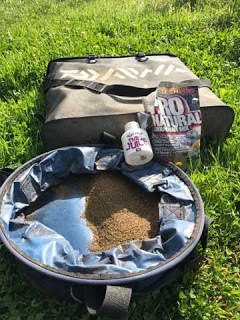 I got one of my new rigs out, a Drennan 0.4 gram Pencil to fish just past the reeds as that’s the line where the bream and skimmers seem to be showing, along with a Drennan 0.2 gram AS1 to fish two sections to hand plus a little Preston Chianti for up in the water. On the side tray I had casters, maggots, corn, Bait-Tech Super Seed hemp and I also mixed up some Pro Natural Dark with the Juice added to the water. My neighbours were Nick Payne on my right and Big Frank to my left with Adie next to him, also in our section was Jake on peg 1 and Steve P on peg 2. On the whistle I cupped in two pots of caster and corn at 8 metres just off the reeds to my right and then three balls of groundbait at the same distance off the reeds to my left before starting on the top two to hand rig with single red maggot on the hook and was soon catching small rudd and roach, I switched to caster and started getting the odd better fish but I was also bumping a few. With nobody really bagging I stuck with it and got to 50 fish in just over an hour for around 2.5lb before having my first look on the longer line with corn on the hook. 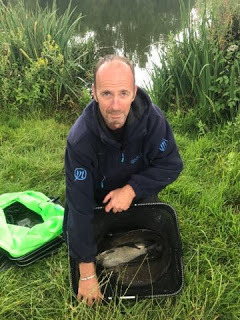 I gave it thirty minutes but no indications saw me try over the groundbait line with the same result, I tried caster but only had a few small fish and much like the last match I was starting to wish I’d just stayed on the short line and not wasted time trying to catch bonus fish. I fed both longer lines again and went back to catching rudd, roach and perch and even had a Dillington barbel (gudgeon). 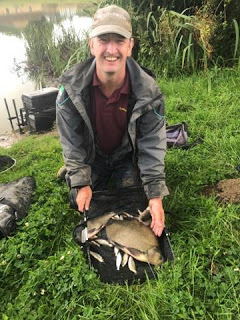 Bill had a couple of skimmers down on peg 13 and Adie landed a good bream but from what I could see nobody was bagging. I probably had 4lb or so was doing okay and then things got even better when I hooked a decent fish which turned out to be a lovely little tench around the pound mark. 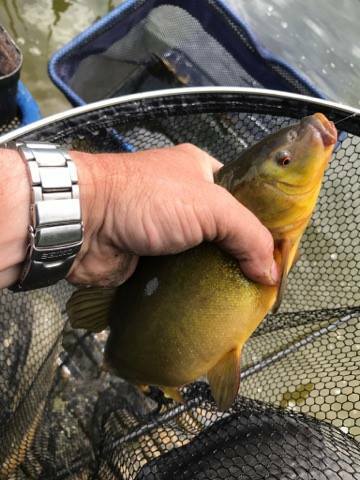 I was still catching small fish quite well but as a few more skimmers were starting to show I had another quick go over the longer line but still no bites. Frank phoned Jake who said he’d had a couple of chub and bream so it was looking like he’d frame and I thought Adie and Bill (who had now landed a bream) would be up around there too but with the bream averaging 4lb apiece and the skimmers about a pound, they probably had 6-7lb each and I didn’t think I was too far away from that. I decided to get my head down and fish the short line as I thought double figures was still possible. We’d had a few showers but thankfully nothing anywhere as bad as predicted although I did have to put my coat on. 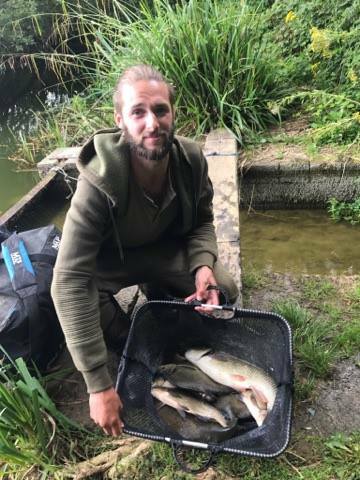 But then Nick has had two decent fish in quick succession and it was all getting rather tight, I reached 128 fish, which at an ounce apiece would give me 8lb or so, hopefully a bit more as I had that tench but then Nick landed another bream and I had to have another go for a bonus fish. I fed some more corn and casters and would go over it for the last hour, I carried on catching roach and rudd and got to 150 with sixty minutes left so picked up the heavier rig and went out with a grain of corn on the hook and fed some hemp and casters via a toss pot. Half an hour passed without any indications and I was just starting to think I was wasting my time, when the float dipped and slid away, I struck expecting to be met with solid resistance but missed it! I thought to myself it was probably a roach and shipped back out and lowered the rig in, the float barely settled before disappearing from view and this time the elastic did come out. It was obviously a decent fish and I have to admit my heart was in my mouth when I could see it was a nice slab around the 4lb mark and breathed a sigh of relief as it slid over the rim of the net. That fish put me right back in the mix and I was hoping there was still time for a few more, I had to wait 15 minutes for the next bite which was a skimmer about a pound and next chuck I had another and with ten minutes still left on the clock, I was praying for another but that was my lot. I quickly packed up and took some of my kit back, Frank said he’d struggled and Adie was admitting to 10lb. I had the scales so walked up to peg 1 to start the weigh in, as I passed Nick he said he had seven or eight decent fish including two good bream. 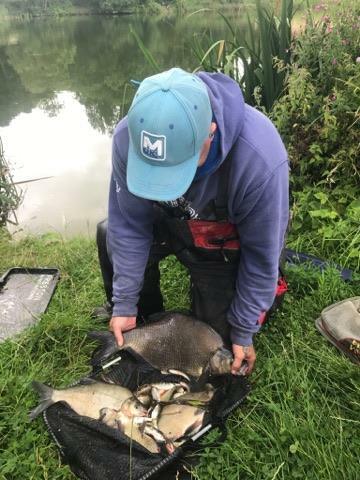 Jake had a nice bag of chub, bream and skimmers weighing 21lb 3oz and I didn’t think anybody else had that, Steve P was next and had 6lb 2oz from peg 2 before we got to Nick, he weighed 15lb 13oz and I thought I’d be just short of that. As it turned out I was a lot closer than I thought when the needle settled on 15lb 5oz and I was cussing as I’d missed/bumped and dropped off a couple of pounds of fish today. Frank had 5lb 2oz from peg 8 (but was camera shy this week) and then Adie weighed 11lb 15oz which included a big, dark old bream. 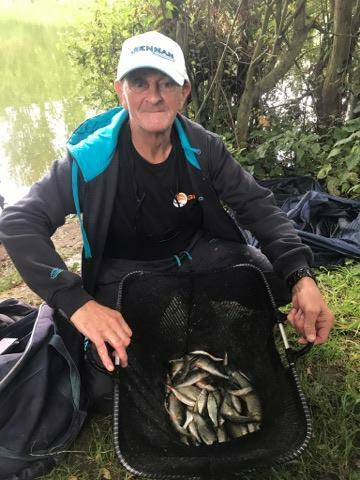 Back at the results and top weight in the other section was Fieldy with 10lb from peg 14 followed by Bill with 6lb 12oz from 13, Rich S had 5lb 12oz, Leighton had 3lb from 24 and Rob chucked back on peg 19. So I ended up in third place and picked up £25, an enjoyable day and it was nice to finally get a few better fish on corn but they haven’t turned up until the last thirty minutes and that 9lb of fish from the short line has been crucial. 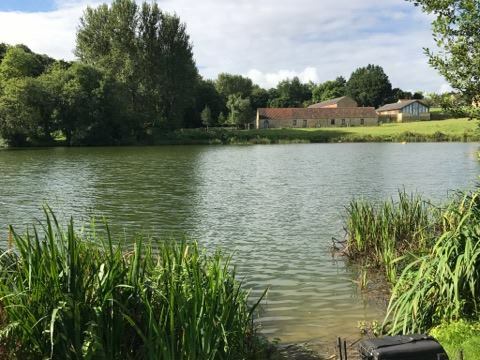 Next weekend I’m fishing a double-header with Todber Manor on Saturday and Perry St on Sunday, I’m really looking forward to Todber but I’m also under no illusions and expecting a battering! Next: Next post: A Long Time?